Practice Advanced Machining questions and answers for interviews, campus placements, online tests, aptitude tests, quizzes and competitive exams. This set of Advanced Machining Processes Multiple Choice Questions & Answers (MCQs) focuses on “Ultrasonic Machining – Introduction”. 1. Of the following scientists, who discovered USM? Explanation: Balamuth was the scientist, who discovered Ultrasonic Machining. 2. What is the full form of USM in advanced machining process? Explanation: Full form of USM in advanced machining processes, is Ultrasonic machining. 3. USM removes materials using ____ tool? Explanation: Material is removed using axial oscillating tool. 4. Which is softer material in USM? Explanation: Tool is softer than work piece in USM. 5. Frequency of tool’s oscillation in USM ranges between? Explanation: Frequency used in USM is between 18 – 20 kHz. 6. Amplitude of oscillation of tool in USM ranges between? Explanation: The optimal range used is between 10-40 μm. 7. In which year, discovery of USM took place? Explanation: Ultrasonic Machining was discovered in 1945. 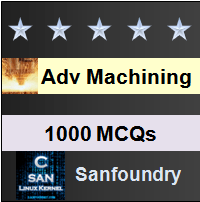 Sanfoundry Global Education & Learning Series – Advanced Machining. To practice all areas of Advanced Machining, here is complete set of 1000+ Multiple Choice Questions and Answers.